Pogradec[a] (definite Albanian form: Pogradeci) is a city and municipality in central Albania, situated on the shores the Ohrid lake. The lake is one of Europe's deepest and oldest lakes. It is located in the County of Korçë. This city is surrounded by hills on the southern and western side. The lake is in the eastern and northern side of the city. The highway linking to Tirana, Elbasan and Korçë passes through the city. It is located southeast of Elbasan, southwest of Ohrid in North Macedonia, north of Korçë and northwest of Florina in Greece. It was formed at the 2015 local government reform by the merger of the former municipalities Buçimas, Çërravë, Dardhas, Pogradec, Proptisht, Trebinjë, Udenisht and Velçan, that became municipal units. The seat of the municipality is the town Pogradec. The total population is 61,530 (2011 census), in a total area of 594.77 km2. The population of the former municipality at the 2011 census was 20,848. Pogradec alone occupies about 15 km². The name of the town is Slavic in origin: Pogradec comes from Po(d) (under/beneath) and Gradec (town, city, castle or fortified settlement) and means literally "under the city". This is a reference to the former Illyrian settlement, which was situated on a hill above Pogradec. It was known as İstarova or İstarye during Ottoman rule and was bounded to as kaza center in Görice Sanjak of Manastır Vilayet before Balkan Wars. The earliest human traces in Pogradec area belong to the Early Neolithic period, 8600 cal. B.P, when a small settlement was formed by the shore of the lake in the eastern part of the modern city. "In the Balkan Eneolithic period there were settlements on piles at the north end of Lake Ohrid by the outflow; at the east end of Lake Malik by the outflow; on one side of Lake Prespa; on the east side of Lake Kastoria; and on one side of Lake Rudnik (Khimadhitis). The later settlements at Malik were not on piles; the level of that Lake was lower throughout the Bronze Age. When Polybius wrote of the account which was used by Strabo, there were two lakes near Lychnidus with their own self-supporting factories for pickling fish. The two lakes which satisfy this description are Lake Ohrid and Lake Prespa. Lychnidus is one of the locations for the Illyrian tribe of the Enchelii that is near Pogradec.The area in the antiquity was at the border between Chaonia and Illyria. 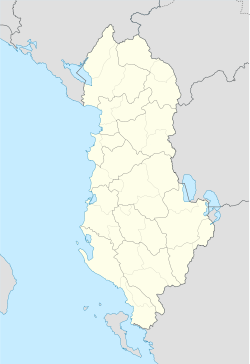 During the 5th and 4th century B.C the area was the center of the First Illyrian Kingdom led by king Bardylis and his son Cleitus. Many cities were developed in the area during this time. Among them was the capital of the Illyrian Kingdom, Pelion which is believed to be situated in the modern-village of Selce e Poshtme in Mokra region and Enchelana, situated on the top of the hill overlooking Pogradec. During the Roman period the area remained as an important connection point between the Adriatic coast and the inner Balkan lands as Via Egnatia, that connected the Adriatic port of Dyrrachium (modern-day Durrës) with Byzantium, passed next to the shoreline of Lake Ohrid. Christianity was spread in the area from its beginning. This is proved by the existence of the Paleo-Christian Basilica of Lin, a trichonch church whose floors are made of mosaics. The South Slavs began to arrive in the area during the 6th century AD. By the early 7th century it was colonized by a Slavic tribe known as the Berziti. From the 8th until the 14th century, Pogradec area was captured by various medieval states such as the Bulgarian, Byzantine and Serbian Empires as well as by noble Albanian families such as Gropa and Balsa. In the middle of 15th century the area became part of Skanderbeg state and after his death in 1468, it was invaded by the Ottomans who kept it until Albania's Independence in 1912. During their occupation Pogradec was the center of the kaza of Starova and was developed as a small town of craftsmen and fishermen. When the Turkish traveler Evliya Celebi visited the area in 1662 he wrote that "Pogradec was a sweet city with red roofs, four neighborhoods, four mosques, two elementary schools, six hundred houses and one hundred and fifty shops". During the second half of the 19th century and beginning of the 20th century, Pogradec area played an important role in the Albanian National Renaissance. In 14 March 1887 the second Albanian language school was started here. During WWI Pogradec became a battlefield divided between the enemy fronts. From 1914 until 1920 Austro-Hungarian, Serbian, Greek, Bulgarian and French armies, captured the city replacing each-other from time to time. During WWII the city was first invaded by the Italian army in 12 April 1939. Italian occupation of Pogradec was interrupted due to Greco-Italian War and Greek troops occupied the city between 30 November 1940 and 14 April 1941. After Italy's capitulation in 1943 the Italians were replaced by the German Nazis who kept the city until 30 August 1944 when it was liberated by the Albanian partizans. After the war the town was a favorite summer escape for many communist government officials and particularly Enver Hoxha. The summer residences and the area around them were sealed off from the public. The area of Pogradec is the site of a possible UNESCO World Heritage site. The climate of the Lake Ohrid is classified as a local-continental type because of a microclime that is created in that area influenced by Mediterranean climate. The average annual rainfall in the Lake basin amount to approximately 730 mm. Pogradec is located about 139 km from Tirana, the capital city of Albania, 40 km from Korça, and 5 km from North Macedonia. Pogradec is the last railway station: Tirana - Durrës - Elbasan - Librazhd - Pogradec and located along SH3 road that passes through Devoll and continues to Greece. Translake transport started on 15 June 2014 with a tourist ferry between Pogradec and Ohrid, but the service is sporadic and unreliable. Pogradec is well known for its famous writers and poets such as Lasgush Poradeci and Mitrush Kuteli, and lately Luan Starova. Their works are a crucial part of Albanian literature. The main characters of Luan Starova's cycle of novels, "The Balkan Saga", are the author's own parents and their family, who fled Pogradec for Macedonia during World War II. Separated from their old hometown and their relatives by the Albania-Yugoslavia border during the Enver Hoxha's era, they would often look at Pogradec through a binocular from the vantage point of Monastery of Saint Naum on the other side of the lake. Pogradec is also the home of nationally acclaimed painters like Anastas Kostandini(Taso), Gjergji Lako, Gentian Zeka, Vangjo Vasili and Ilir Dhima. All kinds of sports are practiced in town, especially by the youth. Pogradec has a professional soccer team (currently in the Superliga,the best division in Albania) which holds the name Pogradeci. There are several varsity soccer teams mainly composed of high school students. Even volleyball and basketball are played competitively. During the summer, beach volleyball draws the attention of all the residents. Many professional volleyball teams from Albania and other Balkanic countries participate in a championship which lasts about two weeks. Pogradeci team has been awarded the first prize several times. Other sports to mention are swimming and boxing. The boxing team, "Dragoi", is one of the top teams in the nation and has always trained champions. Pogradec has also a rich folklore. Many songs and dances have been created throughout the centuries. Their themes are based on the beauty of the lake and the love for nature. "Puppet Theater Festival" - Takes place every June. Participants vary from national to European level. "Lake Day" - Takes place in 21 June. All towns of lake Ohrid (Pogradec, Ohrid and Struga) gather in a festival where local delicacies, including food and culture are showcased. "Balkan Film Food Festival" - Takes place in September. Balkan movies, documentaries and culinary are showcased throughout the days of the festival. "Wine Fest" - Takes place in December. Pogradec families compete together for the best homemade wine in the city. The days of the festival are accompanied by great food and live music. The football (soccer) club is KS Pogradeci. ^ "Natural and Cultural Heritage of the Ohrid Region". Retrieved 6 April 2014. Wikivoyage has a travel guide for Pogradec. Wikimedia Commons has media related to Pogradec.